In chess, each player has one of two equivalent sets of pieces of different colors. In discussions about play, a distinction is often drawn between pawns and more valuable "pieces." Each piece moves in a different pattern. The rook moves any number of squares orthogonally to the players (forward, backward, left or right). Also see castling. The bishop moves any number of squares diagonally. The queen moves any number of squares orthogonally or diagonally. The king moves only one square orthogonally or diagonally. Also see castling. The knight moves in an "L"-shape (two spaces in one direction and one space orthogonally to it). The knight can jump over other pieces when moving. The pawn can only move away one space (or two spaces, see below) forward in a straight line away from the player, unless there is an enemy piece diagonally (either left or right) one space in front of the pawn; if such a situation occurs, then the pawn may either move diagonally to capture that piece or continue moving in a straight line. The pawn can move one or two spaces if it hasn�t moved from its original square. Also see en passant. Pieces capture opposing pieces by replacing them on their square, except for the en passant rule. Some chess variants or certain kinds of chess problems call for non-standard fairy pieces. Chess set colors are usually black & white, brown & cream, black & red, or green & white. 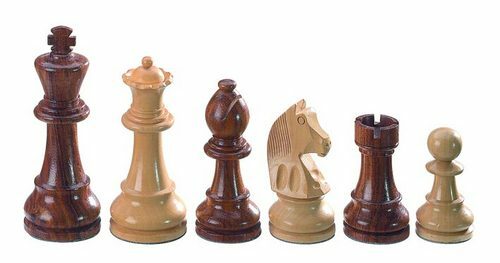 Chess pieces used for play are usually 3-D figurines that are taller than they are wide. For example, a set of pieces designed for a board with 2″ (5 cm) squares will typically have a king around 3.75″ (9.5 cm) tall. They are available in a variety of designs, with the most well-known "Staunton design" which is named after Howard Staunton (a 19th century English chess player) and designed by Nathaniel Cook. The variation of designs available is broad, from highly abstract representations to themed designs such as those which emulate the drawings from the works of Lewis Carroll or modern treatments such as Star Trek or The Simpsons. Themed designs are often intended for display rather than for actual play. On computers, chess pieces are often 2-D symbols on a 2-D board, although some programs have fancier 3-D graphics engines with more traditional designs of chess pieces. In essence, nearly any object can be used to represent a particular piece, if agreed to by both players. For games played at the top level, pieces made of wood are common but for lower-level games or very large tournaments, plastic sets are more common. Although the physical color of chess pieces may vary, the lighter color is called "white" while the darker color is called "black." For actual play, pieces of the Staunton design are the standard. The height of the king should be between 8.65cm and 11.5cm (3-3/8 inchs to 4-1/2 inchs) tall. A height of 9.5 to 10.2cm is preferred. The diameter of the king should be 40-50% of its height. The size of the other pieces should be in proportion to the king. The size of the squares should be approximately 1.25-1.3 times the diameter of the base of the king. Squares of size of approximately 5.7 cm (2.25 inches) normally are well-suited for pieces with the kings in the preferred range of 9.5 to 10.2 cm in height. The pieces should be well balanced. Some small magnetic sets, designed to be compact and/or for travel, have pieces more like those used in Shogi and Xiangqi — each piece being a similar flat token, with a symbol drawn on it to show which piece it is. This article is based on the article chess pieces from the free encyclopaedia Wikipedia and stands under the GNU-Licence for free documentation. In the Wikipedia a list of the authors is available.